That’s Susan Lalanne pointing to the shorebreak before the Hapuna Roughwater Swim. If that last name looks familiar it’s because her uncle is Jack La Lanne the original fitness guru. Sue is a fitness nut too and is often swimming, running and canoe paddling. 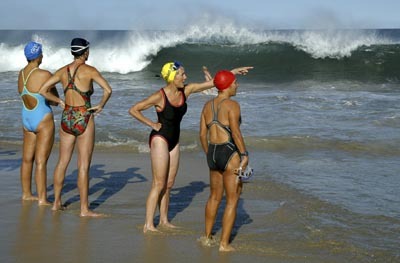 The shorebreak was big at the beach which made it a challenge for swimmers just to get out into the water for the race. Previous PostPrevious Who’s bugging me?